Looking for the perfect gown for your spring wedding? It never hurts to check out the latest trends of the season and see if any of the newest looks are your style, or even if you’re just looking for some ideas to have in mind before you go dress shopping. The NY Wedding Planning Examiner listed 10 of this spring’s top wedding fashions, and I couldn’t resist sharing them with you! Lace Lace is incredibly classy and romantic, and can be worn for an evening wedding, or during the day. All-over lace wedding gowns are going to be huge this spring, so if you’re looking for a break from all the taffeta and satin, give lace a try! Feathers Many gowns on the runways this year featured feather embellishments. Some gowns were fully covered in feathers, and some had just a few feather accents. Ruffled Tiers Ruffles add texture and movement to dresses, and this spring many gowns have ruffles from the waist down, or at the bottom of the dress. Beading Beading is another gown embellishment that is quickly becoming a trend this spring. The beading can be head to toe, or just a small embellishment. Mini Dress A hot new trend this spring is the mini dress. This style is perfect if you’re looking for a second dress to wear to the reception that won’t get in your way, or even if you’re just a bride looking to spice things up by not wearing a floor-length gown. Off-the-Shoulder This spring, sweeping necklines that graze the arms is all the rage in bridal gowns. 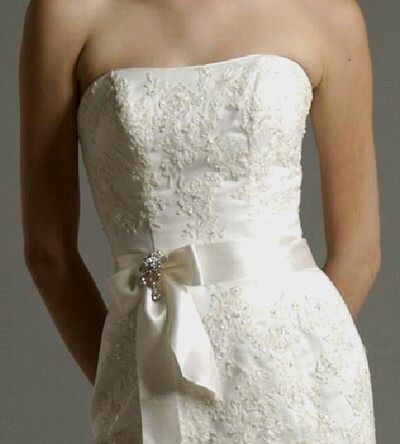 If you’re looking for an alternative to strapless and sleeveless, the off-the-shoulder style is a lovely choice. Netting Fabrics Many of the 2010 runway gowns featured netting ranged in dots, pleats, and metallic embroidered lace giving depth to the gown. And, in some cases, draped netting gave the illusion of chapel-length trains. Hair Accessories Big bows, feathers, flowers, and birdcages were just a few of the accessories adorning the brides at fashion shows this year. Accessories can make your bridal ensemble look polished from head to toe. Touches of Black Whether it’s a black sash, a touch of black beading, or black flowers, black accents are making their way to the runways and dress shops this spring! Bold Gems Gems on wedding gowns this spring are either barely there, or bold and brazen. Diamonds, crystals, platinum, and pearls create elegant and classy accessories to beautiful gowns. Layering longer and shorter strands of pearls creates a new look on a classic trend. Also, going with diamond stud earrings or a classic diamond necklace will always add to your look.